This recipe is easy to assemble, but it does take 40 minutes to cook, which gives you time to clean the kitchen! If you’re looking for cheeses that are compatible with the Specific Carbohydrate Diet (SCD), you can use cheddar, havarti, brick cheese, Colby, Gruyère, or Swiss. Use soy creamer so that the creamer doesn’t separate. And don’t skip the hole-poking in the pie crust; it really does make a difference. Thanks to Colleen Robinson for her contribution of this appetizer for the whole family. In a bowl beat egg whites with the broth, soy creamer, parsley, and salt. Set aside. Use a fork to poke holes in the bottom of the frozen pie crust. Bake the crust for 5 minutes and take it out of the oven. 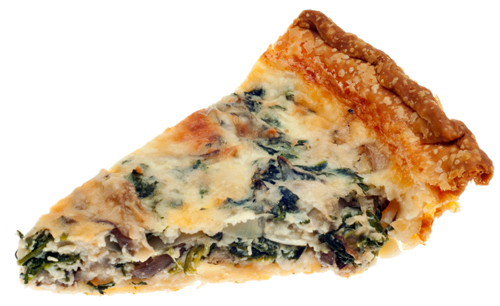 Spread the spinach over the bottom of the crust and then sprinkle the green onions and mushrooms over the spinach. Pour the egg mixture over the spinach, onions, and mushrooms and sprinkle the Parmesan on top. Bake for 10 minutes and then lower the heat to 325 and bake for 25 minutes more. It’s done when you can stick a knife in the middle and it doesn’t come out with raw egg on it. Clean your mushrooms by brushing them rather than washing them. Although you may be inclined to wash a fungus that grows in cool, dark, moist soil, chefs insist that washing mushrooms makes them mushy. You can buy a mushroom brush or cheat and buy a cheap, soft toothbrush; brush all the junk off them and cut the bottom bit off, and you’re good to go. Per serving: Calories 162; Fat 9.6 g (Saturated 3 g); Cholesterol 4 mg; Sodium 635 mg; Carbohydrate 13.1 g (Fiber 1.1 g); Protein 6.6 g; Sugar 3.2 g.